^ Ryan Reynolds Talks Deadpool & Spinoff Possibilities. Screen Rant. ^ 2014-09-18, Deadpool Movie Officially Set for 2016 Release, IGN. ^ Andrew Dyce. Ryan Reynolds Confirmed To Star in 'Deadpool' Movie. Screen Rant. ^ Ian M. Simpson. This Story Proves That Ryan Reynolds Was Born To Play Deadpool. moviepilot.com. 2016-02-16 [2016-02-23]. （原始内容存档于2016-02-19）. ^ Johnston, Rich. Rob Liefeld On Getting Creator Credits On The Deadpool Movie For Him And Fabian Nicieza. Bleeding Cool. 2016-02-08. ^ Ching, Albert. Interview spark "Deadpool" creator credit controversy; Liefeld, Nicieza respond. Comic Book Resources. 2016-02-08. ^ MacDonald, Heidi. Deadpool news round-up: Times kicks off Liefeld/Nicieza tussle; Todd Klein studies the logo. Comics Beat. 2016-02-08. ^ New Mutants (1983) #98 – Comics. Marvel Comics. [2015-05-03]. ^ McElhatton, Greg. The Busiest Man in Comics. Wizard (Wizard Entertainment). 1993-01, (17): 45. Rob Liefeld created Deadpool's name and look, and I came up with his snappy patter. ^ Hughes, Mark. 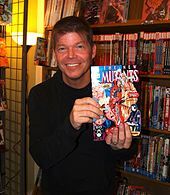 Interview: Rob Liefeld Talks 'Deadpool', Comics, Cable, and More. ^ The Mouth Behind the Merc. Complex. ^ Shutt, Craig. Bad is Good. Wizard (72). 1997-08: 39. ^ Rogers, Vaneta. 2 Great Tastes That Taste Great Together: Joe Kelly/Deadpool. Newsarama.com. 2009-07-16 [2009-08-12]. ^ 21.0 21.1 Kate Willaert. You don't know merc: a history of Deadpool. acriticalhit.com. A Critical Hit. 2013-07-08. ^ Priest, Christopher. adventures in the funnybook game – Deadpool. Christopher Priest official site. 2000-09 [2009-08-15]. ^ Marshall, Rick. "EXCLUSIVE: ‘Deadpool’ Solo Movie Confirmed, Ryan Reynolds Attached To ‘Wolverine’ Spin-Off", MTV.com, 5 May 2009. ^ Phil de Semelyen. "Ryan Reynolds talks ‘Deadpool’", EmpireOnline, 3 July 2009. ^ Sullivan, Jeffrey. "'Zombieland' Writers To Work On 'G.I. Joe 2' and 'Deadpool'", thecelebritycafe.com, 10 January 2010. ^ Lesnick, Silas. Tim Miller Taking Deadpool. Superhero Hype. 2011-04-08 [2011-07-17]. ^ DEADPOOL movie will be "nasty" says Ryan Reynolds. 2011-06-12 [2011-07-17]. （原始内容存档于2011-06-16）. ^ Clevver Movies. Tim Miller Says Deadpool Movie is Closer to Green Light. ComingSoon. November 1, 2013. （原始内容存档于2013-11-03）. ^ Leaked! VFX Test Footage From DEADPOOL Movie!. 2014-07-28 [2014-07-28]. （原始内容存档于2014年7月30日）. ^ Simon Kinberg Confirms Deadpool Movie Is Part Of Shared X-Men Cinematic Universe. Comic Book. October 4, 2014 [October 4, 2014]. ^ Dyce, Andrew. Ryan Reynolds Confirmed To Star in ‘Deadpool’ Movie. Screen Rant. December 4, 2014. ^ Fleming, Jr, Mike. Ryan Reynolds In ‘Deadpool’ Deal. Deadline. December 4, 2014. ^ Kit, Borys. Gina Carano Joins Ryan Reynolds in Fox's 'Deadpool' (Exclusive). The Hollywood Reporter. February 13, 2015. ^ Perry, Spencer. Morena Baccarin Joins Deadpool as Female Lead. February 18, 2015 [February 19, 2015]. ^ Lealos, Shawn S. Deadpool Movie to Include Colossus. Renegade Cinema. February 14, 2015 [February 14, 2015].